You remember it - the first time Star Wars reached in, grabbed your heart, and refused to let go! Whether it was a scene, a character, a ship, or a duel, the moment is likely emblazoned on your heart and mind, and has forever impacted your life. It's those experiences - whether from the Original Trilogy or the Prequels, whether battling imaginary enemies with a cardboard tube, or losing yourself in a novel or comic - that speak to fans' hearts, and are echoed throughout our lives. Like you, we also love that galaxy far, far away, and have strived to bring you quality productions each week because we want to share in those continued experiences with you! Therefore, it is with great excitement The Wookiee Gunner, Skytalkers, and Unmistakably Star Wars announce our formal partnership and the formation of The Star Wars Escape Pods Network. Our vision is to be a podcast network, recognized by you, the listeners, as well as industry insiders for our quality, our creativity, and for actively promoting positivity in fandom. We look forward to bringing you high-quality and engaging podcasts that strive to deliver a variety of unique views and perspectives into the Star Wars Galaxy. Unmistakably Star Wars Star Wars resonates with its fans for a multitude of reasons - one of them being the telling of an epic, and sometimes unexpected, journey. Star Wars podcasting is often a reflection of this, as well! As Unmistakably Star Wars celebrates its 100th episode, we are honored and privileged to announce our new partnership with The Wookiee Gunner and Skytalkers podcasts, and the forming of The Star Wars Escape Pods Network. In doing so, we invite you to be part of this epic journey with us and our incredibly awesome partners! The Wookiee Gunner It’s been 3 years since I pulled my mom, Maria, over to the microphone and told her that we were going to start a podcast. Since then, we’ve shared many laughs, engaged in numerous thoughtful conversations, and spoke with various friends and professionals from the Star Wars community. We’ve had a fantastic experience together, and when we were approached for a new podcasting opportunity, I thought it was time to take Rebels Chat to the next level. That’s why we’re happy to announce that our family-friendly, mother-daughter duo will be part of this new podcast network. When I first brought it up to my mom, she said, “What’s a podcast network?” I laughed and explained, but that’s proof that things will be just as hilarious as ever in our show. That said, we hope you continue to stay with us as we enter this new collaborative stage in our podcasting lives. Skytalkers Skytalkers was founded on two best friends who loved Star Wars and needed an outlet to discuss their growing fandom together. The creation of the podcast also led to the creation of countless new friends within the Star Wars community. 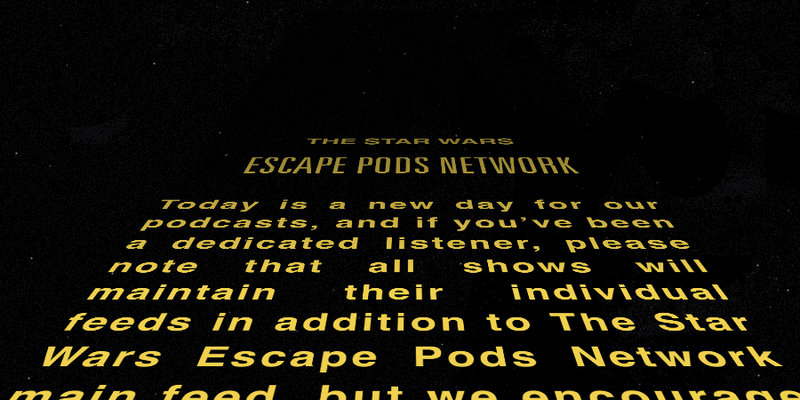 We are thrilled to announce that we are teaming up with some of our new friends from Unmistakably Star Wars and The Wookiee Gunner to form a new project: The Star Wars Escape Pods Network. Dedicated to providing you quality content and in-depth, organized discussions about Star Wars, this new network will include all of our podcasts on the network feed, and some surprises along the way!